To find your ideal property use our Lettings Property Search Form. 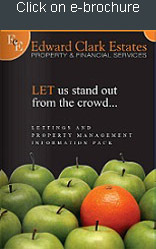 The Property Management Team at Edward Clark Estates in Grays are dedicated professionals and we specialise in corporate and private residential lettings. We are experienced in all aspects of rentals and property management ensuring a stress free and profitable solution to the private home owner and the investor landlord. An empty property is not only losing rental income but also becomes a liability. As soon as we are instructed on a property, we want to get it off our books with a reliable tenant in place who will take care of the property and pay a market rent. We know that our clients often do not want to be involved in the irritations of residential lettings so we also provide a property management service, keeping abreast of regulations so that our clients don't have to. We offer a comprehensive and flexible approach to landlords and tenants and cater for all property types mainly in the Thurrock area from studio flats to fully serviced managed apartments, houses, prestigious residences and corporate tenancies. From carefully matching the right tenant with the right property to supervising the tenancy throughout its duration and leaving you secure in the knowledge that your property is in the hands of an agent who cares and values your custom. We know how to place a property on the market. We have invested in a state of the art web based lettings database that generates 80% of our enquiries. We know what our clients are looking for and we know how to provide it.